Brown University is a school of 8,700 students and 700 faculty members in Providence, Rhode Island. The University operates a hot water and chilled water distributed energy system run off a co-generation plant. The hot and chilled water is distributed in pipes running through a system of tunnels and manholes. The existing piping was insulated and jacketed with aluminum about 30 years ago and had sustained human and mechanical damage over time. Any insulation system needs regular maintenance, but insufficiently trained personnel can inadvertently damage it (see the “Maintenance at a Glance” sidebar). 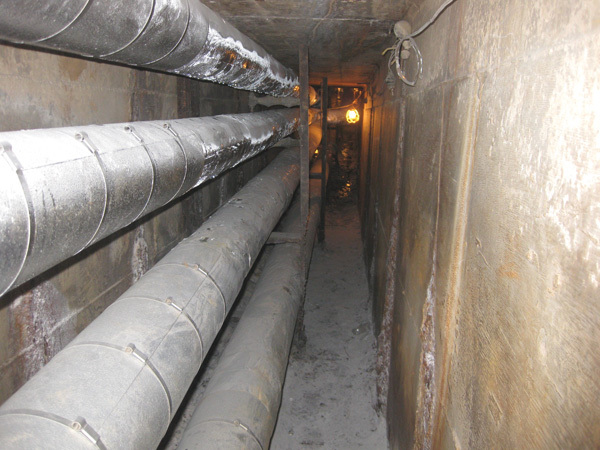 The conditions in the tunnels are humid, damp, and wet—typical of many campus underground utility-piping systems. 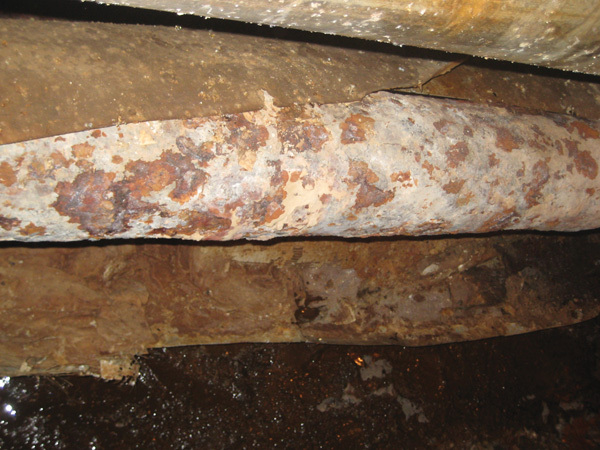 Age, rainwater and snow melt, condensation from the chilled waterlines, and humid air raised concern about pipe corrosion. 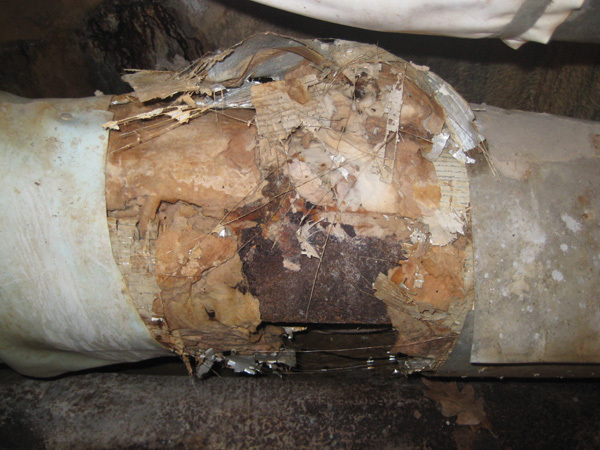 Due to the damage, varying degrees of moisture were detected in the existing insulation, and water on piping is a corrosion risk. The specification called for removal of existing insulation, brushing the pipe surface clean for inspection, and applying new insulation and jacketing. The project to remove and re-insulate the hot and chilled water lines was issued to Anchor Insulation Company, Rhode Island. A site visit was conducted at the selected area on a campus city street. Two manholes about 80 feet apart exposed what looked like four 6-foot 8-in. pipe runs through the dark, 18-foot-deep tunnel. The existing insulation and jacketing were damaged from 30 years of moisture, foot damage from repairmen, and insufficient maintenance. Two of the lines were 345°F high-pressure hot water, while the other two were 40°F chilled water pipes. 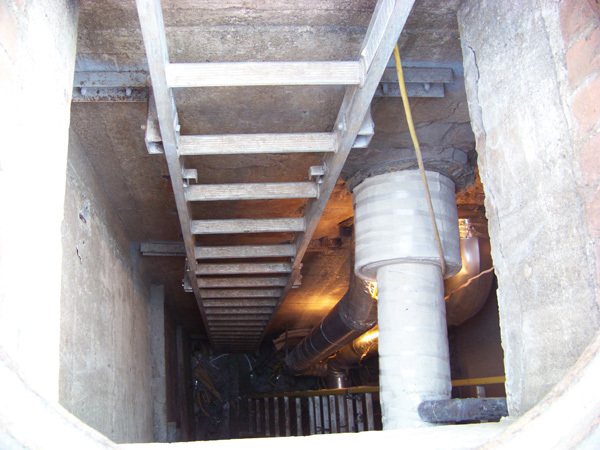 The manholes contained vertical risers of each pipe in addition to the horizontal runs. A rigid insulation was originally considered. 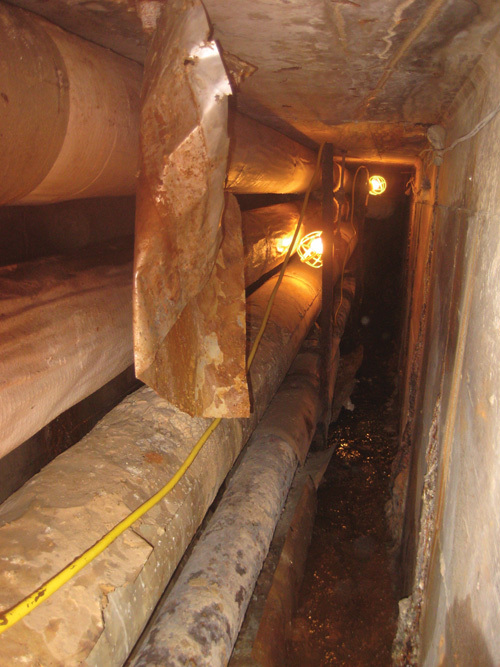 The confined space in the tunnel, illustrated in Figure 4, would be challenging for the crew transporting long segments of any rigid insulation through the tunnel, which had barely enough room for the men to crawl through. In tight spaces, the uninstalled insulation would be in the way, potentially obstructing an emergency exit or rescue. Climbing over and around the stock in such tight quarters would be a drawback. Access to the tunnel was limited and required advanced planning (as explained in the safety overview). After Anchor Insulation evaluated the unusual circumstances and the cramped conditions 18 feet under the road in the tunnel, they considered their insulation material options. Their customer understood the obstacles in these difficult conditions and was open to discussion of options, since many different types of insulation could be used. Together the project team decided on flexible silica aerogel blanket insulation. Silica aerogel is a nanoporous form of amphorous silica that exhibits unique physical properties, including extremely low thermal conductivity. Although silica aerogel is a fragile material and difficult to install in monolithic form, a composite material of silica aerogel material impregnated into a nonwoven batting material shares the properties of a flexible batting material and the thermal resistance of aerogel. Because aerogel has a good thermal conductivity, it requires less thickness to reach the equivalent thermal resistance. This feature was particularly helpful at Brown when dealing with the narrow clearances for the lowest pipe in the pipe rack, where mud had collected in the tunnel. 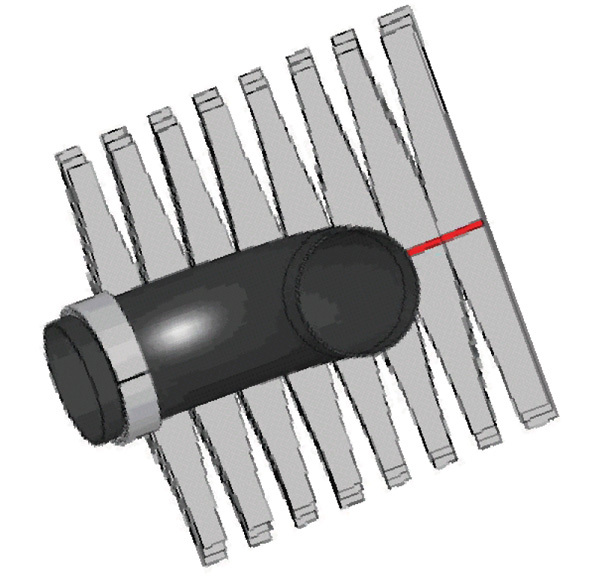 The final insulated pipes could be significantly thinner in profile than the original specification. The first step was cutting required pieces outside the confined space. One insulator cut pieces, rolled them up, and passed them into the manhole. A substantial number of cut pieces could be lowered into the workspace without blocking egress. The material then was maneuvered down the tunnel without fear of breakage. The silica aerogel pieces were fitted onto the pipe sections by wrapping around the circumference of the 6 in. NPS. Adhesive and tape were used to hold the wrapping in place and seal circumferential and longitudinal seams on the chilled water lines. Finally, the embossed aluminum jacketing was wrapped over the installation. The project presented a variety of safety challenges. First, all the work was conducted in confined space and required full-body protection, Tyvek suits, and full-face respirators. In addition, each man had to be in full fall protection to facilitate rescue if needed. Continuous air monitoring was required, and an exhaust and supply air fan were on site to control airflow and temperature. Additional construction lighting was added to increase the workers’ visibility. 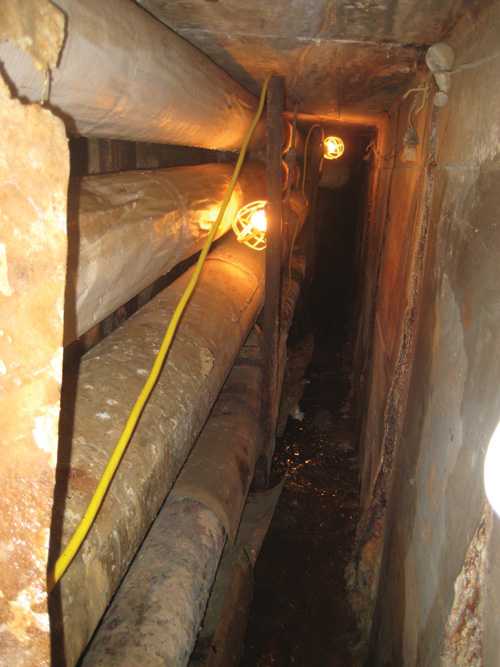 “Confined space” does not always equate to a tight area, but this tunnel space was extremely tight. With multiple associates working in the same space, as the work required, strict production rules had to be established and maintained to avoid interruption of work flow and, more importantly, to maintain a safe environment for the demanding work. Site access and traffic control, along with hole monitoring and standby rescue, made the job even more complex. The difficult and unusual conditions involved in working in a cramped tunnel 18 feet below a campus road called for innovative thinking, planning, and safety awareness. The contractors involved needed to understand the unique circumstances, modify the insulation specification, and research the proper insulation for the job. After the completion of the installation, the Anchor Insulation and Brown University workers had an easier time maneuvering and a safer environment, and therefore they were more efficient and spent less time in the tunnel. Future maintenance, which all insulation systems require, also will be facilitated by the expanded space for passage of personnel in the tunnel due to reduced pipe insulation thicknesses. Additionally, this work earned Anchor Insulation the 2010 “Excellence In Construction” award from the Rhode Island chapter of the Associated Builders and Contractors (ABC) association for outstanding performance in the following areas: safety, complexity, timeframe, and challenges that needed to be overcome. To learn more about insulation products, visit www.insulation.org. To submit a case study, e-mail editor@insulation.org. Insulation degraded by age and moisture. Evidence of pipe corrosion that needs inspection. Wrapping of silica aerogel insulation on pipe, followed by jacketing and banding. Example of field-cut “lobster-tail” allows insulation material to conform to elbow. 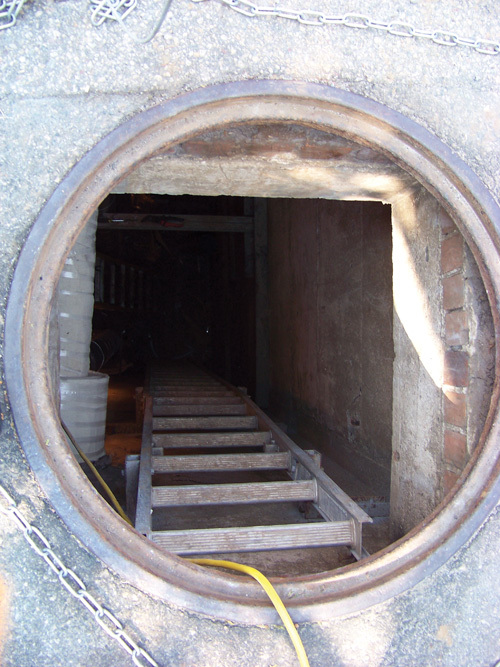 Manhole confined space access point. 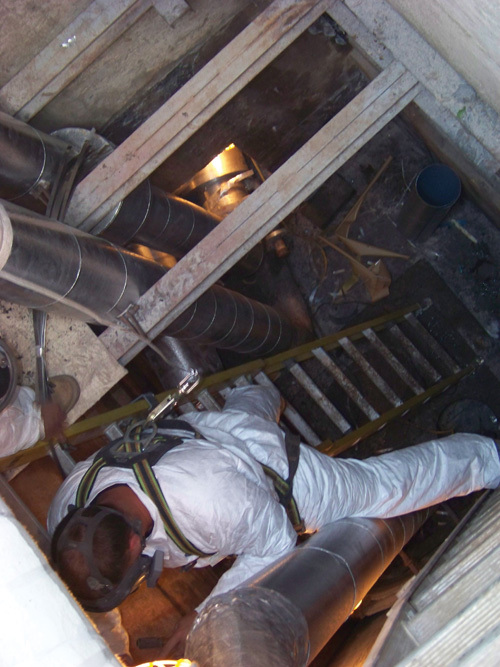 Confined space access ladder and piping. Work underway with insulator dressed in full personal protective equipment. Photo of tunnel before insulation replacement. Photo of tunnel after insulation replacement. 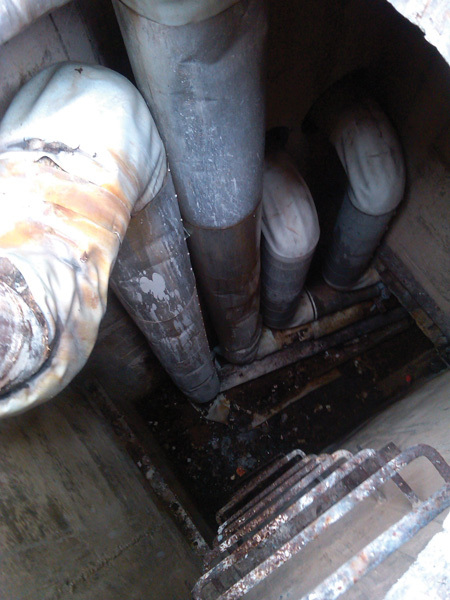 Note increased spacing between pipes and improved view and available room for routine maintenance.